An assortment of handguns and other weapons used in felonies were seized by the Mexican Army, January 17, 2017. From the earliest days of his presidential campaign, a constant refrain from Donald Trump has been the need to protect the United States from foreign threats, particularly violent crime that he falsely asserts is committed at high rates by immigrants to this country. The Trump administration’s protectionist, isolationist, nativist, and racist immigration policy is founded on the scurrilous notion that the United States needs to close the borders and restrict immigration to the country as a way to protect against the entry of violent crime. However, often overlooked in this debate is the degree to which exportation of violence goes in the other direction—that is to say, from the United States to other countries—and, in particular, the substantial U.S. role in providing guns that are used in lethal violence in other nations. Certainly, many of these U.S.-sourced crime guns were legally exported and were not diverted for criminal use until they crossed the border. 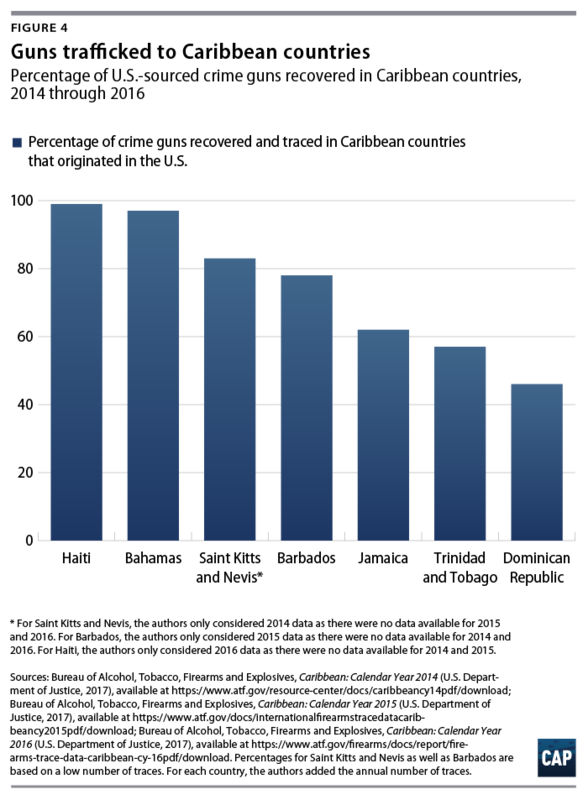 The United States is a major manufacturer and a leading exporter of firearms, legally exporting an average of 298,000 guns each year.3 However, many of the same gaps and weaknesses in U.S. gun laws that contribute to illegal gun trafficking domestically likewise contribute to the illegal trafficking of guns from the United States to nearby nations. The United States has a moral obligation to mitigate its role in arming lethal violence abroad. 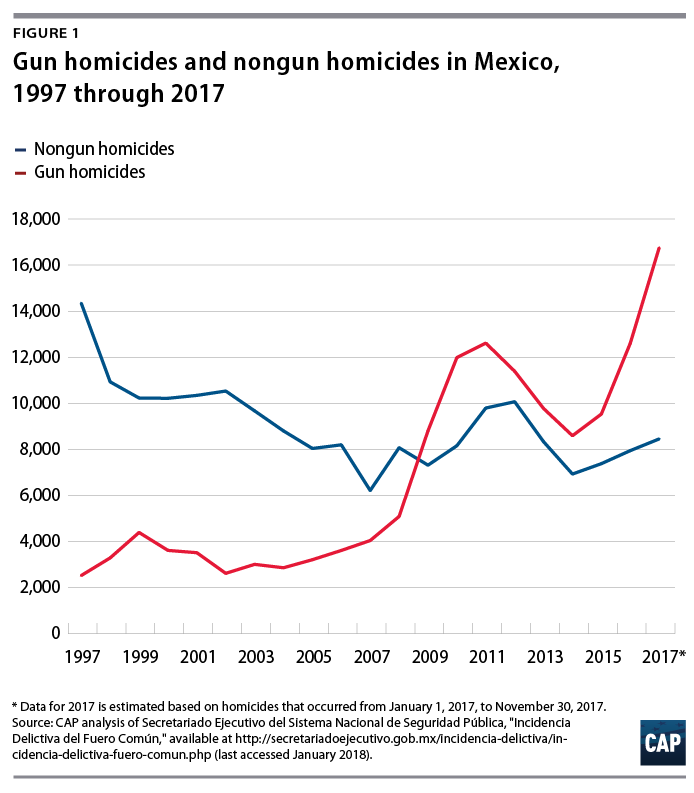 While there are many factors unique to each nation that affect rates of violent crime, there is more the United States could do to reduce the risks posed by U.S.-sourced guns that cross the border and are used in crime in nearby countries. However, the strong gun laws in Canada and Mexico are undermined by their proximity to the United States and its comparatively weak laws. 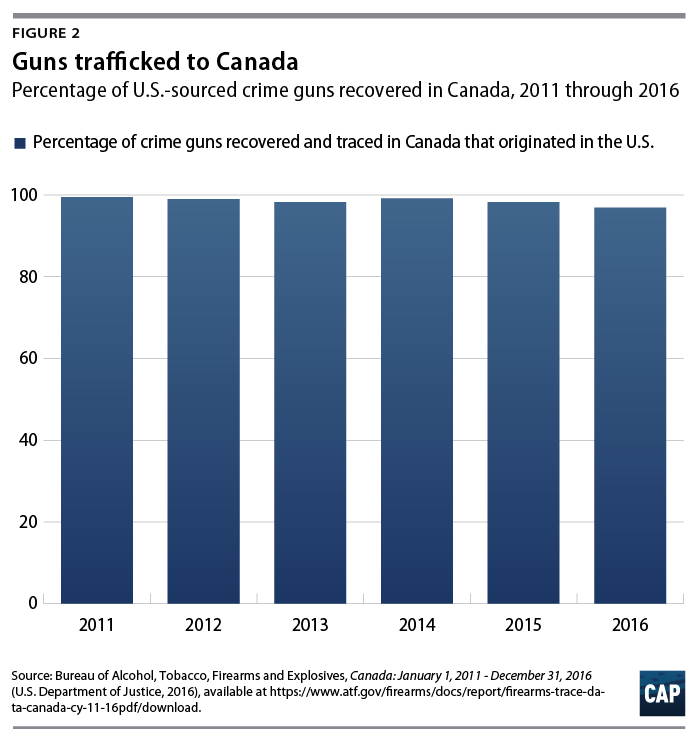 Traffickers along both the northern and southern U.S. borders have developed a variety of methods to exploit the United States’ weak gun laws in order to illegally traffic guns across the border into Canada and Mexico, where they can be sold at a considerable profit. Many of the same policy recommendations often discussed to reduce gun trafficking within the United States would likewise have an impact on reducing trafficking across international borders. Additionally, there are measures that would help law enforcement efforts to combat international gun trafficking and shut off the illegal pipelines that send guns across the borders. Much has been written about the dangerous loophole in federal law that allows guns to be sold in private transactions without a background check and with no questions asked.48 While licensed gun dealers are required to conduct background checks before completing a sale, under federal law, individuals who are not dealers are free to sell guns without a background check. This gap in the law allows individuals who are prohibited from gun possession to easily evade that prohibition and buy an unlimited number of guns through private, under-the-table transactions. 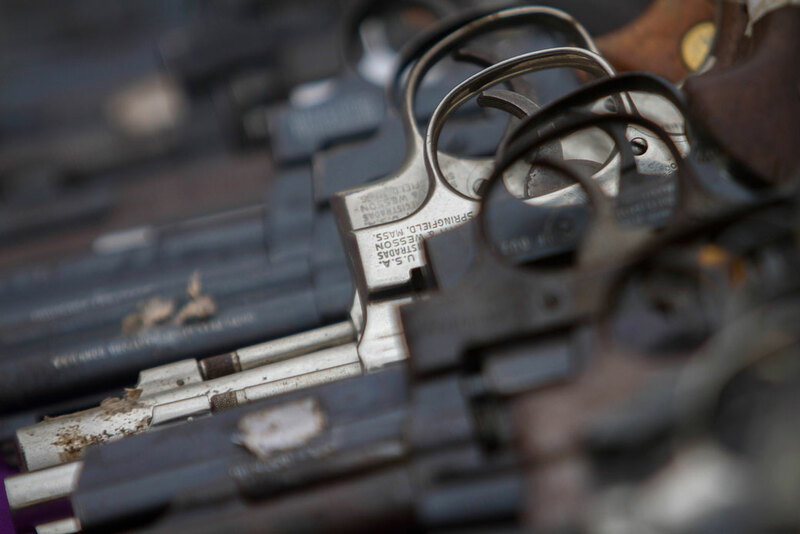 One of the key gaps in current law, which enables both domestic and international gun trafficking, is the absence of a federal law specifically targeting the criminal conduct involved in illegally trafficking guns. Under current law, individuals who knowingly facilitate illegal trafficking by transferring multiple guns to individuals prohibited from gun possession or through straw purchases are often only able to be prosecuted for a paperwork violation. The lack of a dedicated and specific federal criminal offense for gun trafficking and straw purchasing makes it difficult to focus enforcement efforts on those individuals responsible for creating sophisticated gun trafficking channels, which flood vulnerable communities on both sides of the border with guns. One of the tools that federal law enforcement agents use to identify potential gun trafficking are reports from gun dealers noting when an individual buys multiple firearms within a short period of time.60 Under current federal law, licensed gun dealers are required to report to ATF when someone buys more than two handguns in a five-day period.61 However, this statutory requirement does not apply to multiple sales of long guns, such as rifles and shotguns. While ATF publishes annual reports containing aggregated data about U.S.-sourced guns recovered in criminal investigations abroad, they leave out crucial information that would help to inform public policy. More detailed information, such as the types and caliber of firearms recovered, as well as a breakdown of which states supplied the guns recovered in a particular country, would be useful for federal, state, and local policymakers seeking to reduce both domestic and international gun trafficking. ATF should make these data available as part of its annual reports. In light of the high number of U.S.-sourced guns recovered in connection with violent crime abroad, the current administration should consider options for strengthening oversight of firearm exports rather than weakening such oversight through a transfer of this responsibility to the Commerce Department. 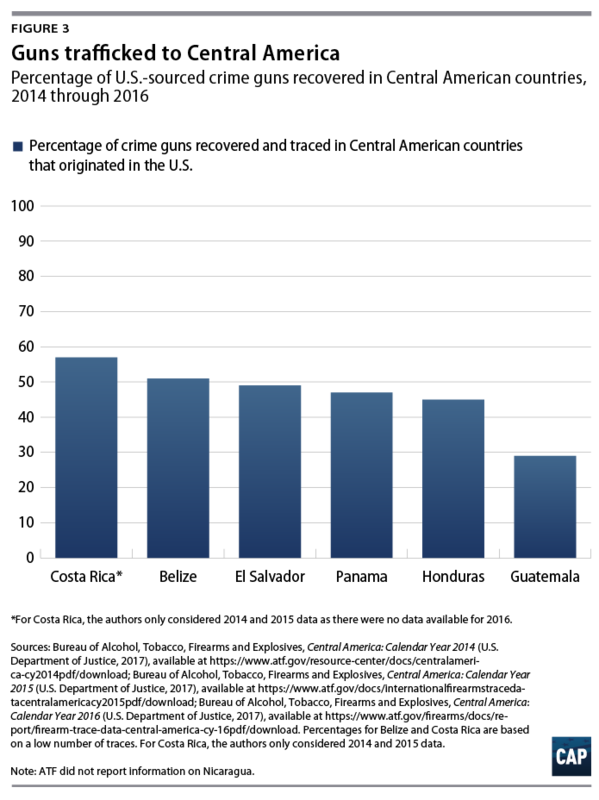 Much of the discussion about gun violence in the United States focuses almost exclusively on the scope and scale of gun violence in this country; the impact on U.S. communities; and policy or programmatic solutions to address it. However, this conversation often fails to consider how the confluence of high levels of gun manufacturing and gun ownership in the United States, coupled with the numerous gaps and weaknesses in U.S. gun laws, results in the exportation of lethal violence to other countries. Policymakers in the United States have a moral obligation to take action to strengthen gun laws in an effort to improve public safety inside and outside of U.S. borders. Chelsea Parsons is the vice president of Guns and Crime Policy at American Progress. Her work focuses on advocating for progressive laws and policies relating to gun violence prevention and the criminal justice system at the federal, state, and local levels. In this role, she has helped develop measures to strengthen gun laws and reduce gun violence that have been included in federal and state legislation and executive actions. Prior to joining the Center, Parsons was general counsel to the New York City criminal justice coordinator, a role in which she helped develop and implement criminal justice initiatives and legislation in areas including human trafficking, sexual assault, family violence, firearms, identity theft, indigent defense, and justice system improvements. She previously served as an assistant New York state attorney general and a staff attorney clerk for the 2nd U.S. Circuit Court of Appeals. Eugenio Weigend is the associate director for Guns and Crime Policy at American Progress. His work has focused on public security. He has conducted research on arms trafficking, organized crime and violence, firearm regulations in the United States, and the illegal flow of weapons into Mexico. He has a Ph.D from Tecnologico de Monterrey and a master’s degree in public affairs from Brown University.